The Victorian Royal Commission into Family Violence suggested that vexatious litigation may share similar characteristics with violent behaviour, namely coercion and control. In this article, through drawing on the insights of a sample of family law practitioners and the narrative of a domestic violence survivor, we seek to explore how vexatious litigation in family law matters may contain elements of such violence. We also see how vexatious litigation can consume significant court resources, and cause financial and emotional hardship upon the other party. Noting that there are more vexatious litigants in the Family Courts than all other jurisdictions in Australia combined, we examine whether the current family law legislation and family court processes adequately protect the other parties, and assist lawyers in dealing with this type of litigator. We also present a number of legislative and non-legislative suggestions for how responses could be improved, with the caveat that any change to better protect parties from vexatious behaviour must maintain a balance with allowing access to justice. Children have a right to be heard and this article is a review of the current practice surrounding this right and an argument that the most effective means by which to assure to this right is by using methods of practice that are child-inclusive. 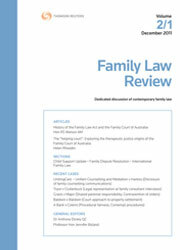 Child-inclusive practice methods, when used to assist in the resolution of family law disputes, have the potential to assist in better decisions and better long-term outcomes for children in terms of their satisfaction with respect to parenting arrangements and for their long-term mental well-being. Judicial interviewing is a practical opportunity by which to include children, but is bound by resistance. Much of the concern about the practice is well-founded. But the ability of international jurisdictions to overcome the many concerns and to move past resistance demonstrates that practice issues and implications are not insurmountable and should not continue as a reason to remain opposed to more contemporary participatory practices. Since the decision of the House of Lords in White v White, concepts of “fairness” have been as pervasive and elusive elements in English property cases as questions of “justice and equity” in Australia. First, this article examines some of the strands that we see in the English cases in the context of “fairness”, namely, the approach to “stellar” or “special contributions”, the needs of the parties and finally the distinctions between matrimonial and non-matrimonial property. It is suggested that the English approach is more focused on prospective factors, primarily the needs of the parties, while the Australian approach is more rooted in historical factors with particular reference to contributions. Although the objectives of both approaches are broadly similar, this article looks at the implications of the different pathways to fairness which each jurisdiction has adopted. With the case stated in Re Kelvin, the Full Court of the Family Court has the opportunity to revise its approach to “stage 2” hormone therapy for young people with gender dysphoria. This article reviews the law in this area and considers some developments since the Full Court’s decision in Re Jamie. CGU Insurance Ltd v Blakeley was an insurance case which, on the surface, has little to do with child support issues. However, in the course of his judgment, Nettle J considered when it might be actionable for someone who is threatened with legal proceedings to bring their own pre-emptive proceedings to immediately clarify matters. His Honour’s reasoning on the point may have direct application to the enforcement of child support debts. Section 90AK of the Family Law Act 1975 (Cth) provides that courts must not make orders or grant injunctions in accordance with Pt VIIIAA of the Act if such orders or injunctions would result in the acquisition of property other than on just terms and be invalid because of s 51(xxxi) of the Constitution. Section 90AK directs the attention of courts and litigants to important protections afforded to third parties in the context of Pt VIIIAA, the provisions of which provide the courts with extensive powers to make orders and injunctions binding persons and entities other than the parties to a marriage. This article explores the contexts in which s 90AK has been considered by the courts and its impact on family law property determinations. For the PDF version of the table of contents, click here: Fam L Rev Vol 7 No 2 Contents.